A. Danger point. Increased linguistic knowledge has led to a surge in linguistic pedantry, resulting in an imbalance. B. Crisis point. Full on pedant. False confidence in good linguistic knowledge has led to pedantic half-truths outweighing facts. C. The road to recovery. Taking time to understand how language actually owrks has led to a more tolerant outlook. D. A sensible place to be. The more you know about language, the more you see the nonsense of linguistic pedantry. Be aware that at point D you may be called upon to challenge people at point B. This can be difficult, as people at point B often have the weight of public opinion behind them. Be patient, and encourage them to move towards point C.
Applicable to many disciplines, alas. So true. The graphic illustrates the stages described in the quotes by Francis Bacon and later, Louis Pasteur “Un peu de science éloigne de Dieu, beaucoup de science y ramène”. (The original English quote is more complex and I’ve forgotten it.) As translators, we’re increasingly tasked with translating hype. Perhaps the invasion of hype — the middle stage in your graphic — is due to the the masses now accessing everything. The only way out is that the masses get better linguistic education, but that’ll take a long time! 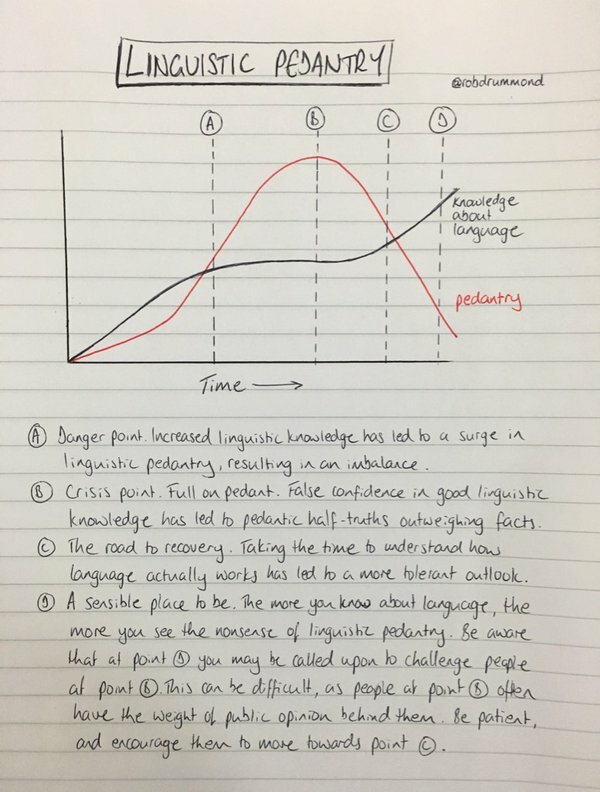 In your graph I note that actual knowledge of the language does not grow during the high pedantry phase and only starts to grow again when you reach point C. Seems pretty realistic to me.